Jake uncovers the truth about Harrison's death and Olivia helps an old friend whose daughter goes missing. Watch Scandal online now! When an old college friend comes to Olivia for help finding her daughter on Scandal Season 4 Episode 3, OPA takes the case. The case causes a rift between Olivia and Abby. Jake tracks down information about Harrison's death and uncovers Rowan Pope's role in the death of Fitz and Mellie's son. He confronts Command with this intel over dinner and tells Rowan to leave town. Rowan refuses. How was Jake able to get that information? You'll have to watch Scandal online to find out. Cyrus has an awkward encounter over breakfast and fails to see that Michael is a setup. The RNC needs their plan to work once they lose the gun legislation bill in court. David Rosen saves the day but may have lost a bit of his own soul in the process. Fitz thanks Abby for her service to the White House and the First Lady and then gets schooled for failing to learn Abby's name despite the fact that she's been working there for several months and that they have a prior relationship through Olivia. His thanks are really a ploy to inquire about his former mistress. 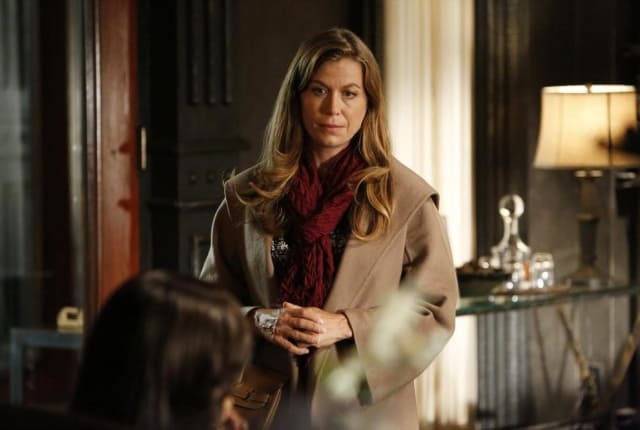 Sonya Walger guest stars on this episode of Scandal. Elsewhere, Cyrus has an awkward run-in during a business breakfast, while Jake uses his connections to get some answers. [to Olivia] Call me later if you want me to do that thing to you. Permalink: Call me later if you want me to do that thing to you. Olivia: Colder. Everything is colder. Permalink: Colder. Everything is colder.